We want to introduce YOU to arguably the BEST Value BCAA capsules in the UK right now – with the CORRECT ratio of amino acids to practically ensure serious MUSCLE GAINS! Our BCAAs contain the RIGHT ratio (2:1:1) of amino acids. In short you get a BIG dose of Leucine (the KEY muscle building BCAA), along with the correct ratio of Valine and Isoleucine. Sourced from one of the World’s leading manufacturers of BCAAs, and encapsulated here in the UK…you can be sure you’re getting the best BANG FOR YOUR MUSCULAR BUCK HERE TODAY! Our Branched-Chain Amino Acids help your body build muscle, and they prevent your muscles from breaking down after a heavy workout. Encapsulated here in the UK! 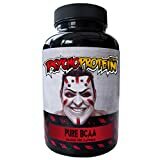 Build ‘PSYCHO-Like’ Serious Muscle and Strength With Our STRONG BCAA Capsules! You’ve probably heard about Branched Chain Amino Acids and how effective they can be for MUSCLE GROWTH. Well, today, we want to introduce YOU to arguably the BEST Value BCAA capsules in the UK right now – with the CORRECT ratio of amino acids to practically ensure serious MUSCLE GAINS! You see, our BCAAs contain the RIGHT ratio (2:1:1) of amino acids. In short you get a BIG dose of Leucine (the KEY muscle building BCAA), along with the correct ratio of Valine and Isoleucine. Sourced from one of the World’s leading manufacturers of BCAAs, and encapsulated here in the UK…you can be sure you’re getting the best BANG FOR YOUR MUSCULAR BUCK HERE TODAY! BCAAs are also thought to help ‘ramp up’ testosterone levels AND ‘human growth hormone’ levels! NO NASTY TASTE! Simply take these capsules with water or your whey protein – and you’re ready to see big increases in size, strength and muscle. And all at a GREAT price. 90 Capsules per bottle, and 600mg per capsule. We recommend 3-4 capsules perday. Try some today, and watch those gains and strength increases come through!